The research instrument and the methods used facilitated the identification of both ideational and economic factors, and their interaction contributing to deficient vitamin A intake among children. This multifactored analysis of vitamin A consumption and practices related to stages of xerophthalmia from a social and cultural perspective enabled the researchers to gain a better understanding of vitamin A deficiency in the research area and factors influencing decision-making for vitamin A deficiency treatment. The study also generated information that highlights local explanatory models as they relate to the stages of signs and symptoms of vitamin A deficiency. The research instrument has practical implications for eliciting data to develop culturally-specific vitamin A education messages and to design vitamin A program strategies in the Filingué region. Furthermore, the data collected could be adapted for vitamin A programming in other sites in the Sahelien zone of Niger, and the methods used can be applied to locations throughout the country. The breadth of knowledge uncovered relating to the causes of ocular signs and symptoms associated with vitamin A deficiency and the extent to which traditional food practices coincide with appropriate preventive measures and remedies is reflective of an in-depth understanding residents have developed due to extensive exposure to stages of xerophthalmia. Furthermore, foods rich in vitamin A, particularly animal sources, are described as having highly sought after qualities such as blood-rich, tasty, strengthening, fattening, and healthful and are generally suitable for children. This information has programmatic implications for the development of regionally-specific health and nutrition education messages. One obvious constraint in increasing consumption is that many of the animal sources of vitamin A are expensive. All three primary key-informants suggested that people in the area cannot afford to eat these more costly foods on a regular basis. For example, one informant said, "Money stops us from buying these good foods," while a second informant, when talking specifically about liver stated, "People cannot afford to spend money on liver unless they are sick-this is when they think that it is important to buy liver." Green leafy vegetables are well-liked and associated with important food characteristics. However, if they are not treated or stored properly, traditional dishes provide a vehicle for parasites. Additionally, preparation often involves extensive boiling of the leaves and preservation methods that expose them to the sun over a two to three day period, depleting the vitamin A value. Other carotene-rich foods have become less available recently with a decrease in gardening. Although the gardening season is short it occurs at a critical time of year when other foods rich in vitamin A may be less available. Efforts could be made to use the various water sources in the area, including the pumped water system operated by the government, to encourage gardening. It also seems feasible that the problem of pillaging of produce could be resolved. Women believe that the nutritional value of food eaten during pregnancy or lactation is passed on to the infant. Although less likely to eat good food for their own needs or benefit, women indicated that during pregnancy or lactation they would alter their diet appropriately for the benefit of the child. This is an important factor that should be considered when developing health and nutrition strategies. Between the ages of one and three, particularly at the time the child is removed from the breast, which is abrupt and traumatic, children in the Filingué region are most vulnerable for developing vitamin A deficiency and associated illnesses. This is a time when children are no longer under the direct supervision of their mother and have to fend for themselves to seek between meal foods. They follow the family food pattern, a diet that does not fulfill children's special nutritional needs, and share meals with their siblings from a communal plate. A way to increase the vitamin A consumption in this age group would be to encourage women to put a portion of ghee or cow's butter into the sauce of the age group most at risk for developing vitamin A deficiency. Once a child reaches three or four years and has developed wuyo, he or she will be better able to obtain between meal snacks. It is important to note that several of the foods richest in vitamin A are labeled as good for children or containing vitamins for children, and are eaten as snack foods. These includes mangoes and carrots, that are relatively affordable, as well as liver and eggs that mothers indicated could be purchased periodically. Health messages promoting an increase in consumption of these nutritious foods could be developed. Several of the mother-respondents interviewed suffered from nightblindness during pregnancy. Although women indicated that the traditional liver treatment should resolve the problem, they suggested that nigh/blindness is caused by the additional requirements of pregnancy combined with the demands strenuous work places on the body, which will pass with delivery. Therefore, if the affliction continues following the home remedy women generally do not seek outside care. Given the number of pregnancies women go through, and the extent to which the deficiency exists, women of reproductive age are at risk for developing vitamin A deficiency, thus putting infants at a higher risk from birth. Mother-respondents consistently associated nightblindness among children with hardship or lack of good food. Among under six-year-olds nigh/blindness is less likely to be recognized prior to the wuyo stage when children can walk and talk. Although respondents indicated that if the home remedy did not work they would take children to the dispensary for treatment of nightblindness the failure to recognize nightblindness among this younger age group puts them at a disadvantage and could result in a delay in administering a home remedy or accessing outside care. The home treatment given to children is generally either liver or another blood-rich food such as meat, green leaves, eggs, or milk. The liver treatment for nightblindness is most widely known and seems to be frequently practiced. If nigh/blindness is to be remedied, these practices must be modified so that the child (or woman) gets adequate portions to resolve the problem. Adaptations of these food measures should be promoted and integrated into nutrition education messages. Although research shows that if the home remedy does not eliminate the problem women generally seek outside care at the dispensary, the time spent at home waiting for the home treatment to work is dangerously long. Educational strategies could be developed to encourage mothers to take quick action. It is important to reiterate that women recognize Bitot's spots and corneal xerosis as severe problems, potentially leading to the loss of both eyes. People frequently indicated that these danger signs are associated with poor diet or lack of sufficient breastmilk and commonly occur in conjunction with other illnesses. But given the extent of household demands women may not have the contact with children necessary to recognize the danger signs when they first develop. The data indicate that the lag period between the time when clinical vitamin A deficiency occurs, which once manifested can develop extremely rapidly, and when it is actually detected could be long. Furthermore, nightblindness is not associated with these later stages and is not considered serious. Since men control the finances and are responsible for paying health care fees, it is clear that male heads of households must also be targeted in any nutrition education/vitamin A programming strategy. In addition, when delineating household decision-making around treatment choice, women indicated that they need to get permission from their husbands in order to visit a health practitioner. It is therefore paramount that men are aware of the seriousness of vitamin A deficiency and its possible health repercussions. Given the apparent extent of the problem in the area, and the high rates of malnutrition and fatality rates associated with measles, adequate stocks of capsules should be available at the health center and routinely administered to children suffering from signs of xerophthalmia and childhood illnesses associated with vitamin A deficiency. Ongoing training of the healthworkers on recent findings of vitamin A deficiency, as well as preventive and curative measures, is also recommended. Hypovitaminosis A is considered one of the major nutritional deficiency diseases affecting populations in developing regions. It has been estimated that approximately 500,000 new cases of xerophthalmia with corneal involvement occur annually in Asia, about half of which may lead to blindness. Before and at the early stage of the founding of The People's Republic of China, vitamin A deficiency was a serious problem and one of the major causes of blindness, especially among children. Along with the development of the national economy and the medical care and health services extended to rural areas, the vitamin A nutritional status has greatly improved. It was recently reported that since the 1960s the incidence of xerophthalmia in China has fallen below .7%. According to a nutrition survey carried out in 1982, the incidence of vitamin A deficiency was .9% among the 30,000 subjects examined. In recent years few cases of xerophthalmia have been reported. However, it was reported that serum retinol levels of rural preschool children were quite low. The percentage of children with serum retinol levels less than 20 mg/dL was 32.7, 37.1, 39.3, and 33.5%, respectively. Of 307 children, six to thirty-six months old in rural northern China, 8.1% had serum vitamin A levels less than 10 mg/dL. In a high esophageal cancer incidence area in northern China, 8.5% of people in five villages had serum retinol concentrations below 10 mg/dL. From a recent study, we know that 40% to 50% of preschool children in rural areas have serum vitamin A values less than 20 mg/dL. A few cases of nigh/blindness in children were found during interviews with parents. The incidence of nightblindness is not high. In a study from 1985 to 1989, the average dietary vitamin A intake of 5211 two- to five-year-old preschool children in eighteen rural sites was 42% to 72% of the Chinese RDA. Of the children studied, 51% to 87% had inadequate vitamin A intake (using a probability approach). In 1990, the baseline data of a surveillance and improvement of children's nutrition project, in 101 poor, remote, and mountainous counties in twenty-seven provinces in China, showed that the average vitamin A intake of preschool children was only 25% to 52% of the Chinese RDA. Two studies showed that supplementation of six-month to three-year-old rural children with large doses of vitamin A decreased the incidence and severity of diarrhea and respiratory disease significantly. A significant decrease in the percentage of children with low height and weight was also observed. In summary, vitamin A, deficiency is possibly a serious problem among infants and children in China, especially in poor, remote, mountainous areas. Kai Feng is a municipality in the east part of Henan province, about 800 kilometers south of Beijing and sixty-five kilometers east of Zheng Zhou City, the capital of Henan province. It is located in the southeast part of the vast Hua Bei flatland. It is bound on the north by the Yellow River, on the west by the Zheng Zhou City, on the south by the Zhou Kou and Xu Chang municipalities and on the east by the Shang Qiu and He Ze municipalities of Shan Dong province. 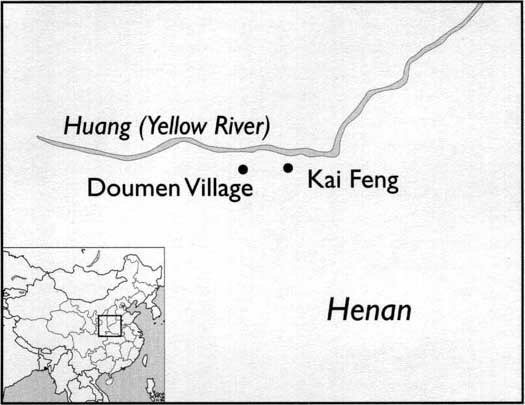 The Yellow River passes on the north boundary of Kai Feng City from west to the east (Map 4). Kai Feng was the capital for four dynasties in ancient China, Xia (21st century BC-16th century BC), Wei (391 BC-225 BC), Wu Dai (907-960), Bei Song (960-1127). It is an ancient city with many cultural and historical assets. Due to the geographical location of the Kai Feng City, it has suffered from many natural disasters, such as flood, insects, etc. The dike of the Yellow River breached an average of every two years from 1194 to 1949. During that time, life mainly depended on the weather and nature. After the liberation, Chairman Mao and the government made great efforts to control the Yellow River. Many irrigation systems and networks were constructed. The Yellow River has been totally controlled and has not breached the dikes since 1949. The Kai Feng area is fifty-eight to seventy-eight meters above sea level. The northwest side is generally higher than the southeast. The total area of Kai Feng municipality is 6444 square kilometers and the city covers 359 square kilometers. The total population is 4.2 million, with .7 million living in city areas. There are four distinct seasons during a year: spring (March-May), summer (June-August), autumn (September-November) and winter (December-February). The average temperature is 14.4�C with the highest (39�C) in summer and the lowest (-15�C) in winter. The average annual rainfall is about 600 mm. Doumen is one of fifteen administrative villages of the west suburb township of Kai Feng city with a distance of ten kilometers. It is five kilometers from the Yellow River. The altitude of the Doumen community is ten meters lower than the bed of the Yellow River. Doumen consists of five small communities, Zhang, Tian, Sun, Wang, and Han Doumen. The study was conducted in Zhang and Tian Doumen. Zhang Doumen has thirty-seven households and a population of 130. Tian Doumen has ninety-six households and a population of 370. The total cultivated land area of these communities is 2500 mu, which equals about 167 hectares. More than three-fourths of the land is sandy and cannot be irrigated. The average cultivated land is about four mu per capita. I he average gross income in Doumen village is about 600 to 700 RMB (8 RMB is equal to $1 US), generated from agriculture. The net annual income is about 400 RMB per capita. Wheat, corn, roots, and beans are the main grain crops raised. The economic crops are peanuts, watermelons, and cotton. There are two village clinics in this community. One village doctor, Mr. Ma, practices both Western and Chinese medicine. The other, Mr. Liu, has practiced Chinese medicine for more than twenty years. Neither graduated from the medical university, but both were trained and passed the government medical examination. The field team in Doumen consisted of Dr. Li Wen Jun. Dr. Li Dan, and Ms. Chang Su Ying as the primary interviewers, assisted by Mrs. Bai Yan, Miss Yuan, and Mr. Wang Wei Dong. The group divided into three teams. Li Wen Jun with Mrs. Bai; Li Dan and Miss Yuan, and Ms. Chang with Mr. Wang Wei Dong. Dr. Li Dan and Miss Chang were trained for two days by Dr. Li using the English manual. All team members were trained for two days using the Chinese translation of the English manual. All other staff members also received training. Dr. Li Wen Jun. Dr. Li Dan, and Miss Chang conducted the basic interviews. The other three persons took notes and assisted in local dialectical translation, as they are local persons. The interviewers were taken to the houses of key-informants and to the sample of respondents, by the local village doctors. The local village doctors (Mr. Ma, Western medicine and Mr. Liu, Chinese medicine) helped find key-informants, and introduced the researchers to the individual households (including the selected respondent households). The interviewers visited each house an average of four times. In this area of central China, those in farming communities grow a significant part of their food, but they also rely on local markets for food not grown at home. In Doumen the soil is sandier than that in some of the neighboring communities, so unlike rural families in most parts of China, the people in Doumen are less reliant on home gardens. The main local crops are soybeans, long kidney beans, hot peppers, peanuts, some varieties of melons, and wheat. Depending on soil conditions, some houses have no home gardens, while others invest considerable energy into cultivating them. In addition to the vegetable crops grown locally, most households raise goats, pigs, and chickens, and some have ducks. Nearly all households have egg-producing chickens. They do not sell eggs, but consume them themselves. Some families buy eggs in the market from time to time. They also rely on their own animals for meat that they consume mainly on special occasions, such as the Moon Festival, the New Year, and other special family observances (including visits of relatives from other regions). Some households obtain foods from small-scale local vendors and traders. For example, an individual may buy a sack of rice (perhaps in Kai Feng City or another region), and then bicycle into Doumen to trade the rice for wheat in local households. Another individual may produce a basket of bean curd (tofu) and go to the village to trade cakes of bean curd for soybeans. Dried noodles, bean sprouts, and some vegetables are traded in the same way. Only a small amount of food is acquired in this manner, but this method may become more significant as new entrepreneurial activities develop in the area. There are two small gallery shops that sell beer, wine, soft drinks, cigarettes, biscuits, infant formula milk powder, fast noodles, soy sources, cooking spices, and other commodities, but vegetables and fruits are usually purchased from the Wang Fu Zai market or in Kai Feng City. The nearest market is in Wang Fu Zai, a distance of three kilometers on the paved all-weather road. Market days are every third day of the lunar moon, as follows: third, sixth, ninth, thirteenth, sixteenth, nineteenth, twenty-third, twenty-sixth, and twenty-ninth. There is no bus service from the village to Wang Fu Zai; the main means of transportation are bicycles, small tractors, and carts pulled by donkeys, mules, or horses. Bicycles seem to be the most important means of transportation for both people and their goods. The list of products purchased regularly in the market is long, but the main food items purchased are shown in Table 6.1. A more complete list of foods purchased in the market and the usual price range is provided in the community food system data tables. Most of the daily food consumed is obtained from that market. A few purchases are made in Kai Feng City, when people have other business to transact there, when guests are expected, or when it is not the market day in Wang Fu Zai. Table 6.2 contains a list of non-animal foods commonly consumed. All of this food is seasonal. I he wild foods (the last three items) are available only for short periods in the spring. Other food items are most abundant in summer and fall. However, the use of greenhouses in the area, including the Doumen local community, has changed the seasonal pattern dramatically in recent years. Tomatoes, chives, celery, cucumber, spinach, peppers, and a few other crops are grown in greenhouses, making them available throughout the year, but the price may be very high during the slack season. There is no clear distinction between cash crops and home gardens since all the crops grown are for home use, even though some are also main sources of income. Thus, soybeans, peanuts, maize, and wheat grown in household plots are both sold and used at home. Peppers are grown mainly for home use. Pumpkins, melons and other miscellaneous crops are also grown. However, since Doumen has sandy soil, a narrower variety of crops are grown in home gardens. Due to the poor quality of the soil, most families do not grow green vegetables, but only towel gourd, calabash, and other crops that are more easily grown. The basic seasons for home production of vegetables are summer and autumn (with planting beginning in March). Therefore autumn-September and October-is the time of peak production. Crops planted most frequently are peanut, purslane, soybean, sweet potato, watermelon, pumpkin, fresh long kidney bean, jujube, wheat, and corn. None of the local crops are green leafy vegetables. We found that people collect more varieties of wild vegetables from the field. The value and price of wild vegetables seem to increase in urban areas, such as in Kai Feng, due to the desire to seek rare and different tastes. The village people consider wild vegetables cheap and easy sources of food, and a good taste change occasionally. The most common wild vegetables consumed in Doumen are: ma zhu cai (summer), sesame leaf (summer), young elm leaf (spring), and scholar trees flower (spring). These wild foods are used seasonally. The young willow and elm leaves are gathered for only about ten days in the early spring. The other wild vegetables like ma zhu cai and sesame leaf are available in summer for about ten to fifteen days, so these vegetables would not be an effective solution to increasing vitamin A intakes in this type of community. Several vitamin A-rich foods are used by the people of Doumen, but not as extensively as would be desired. That is, foods such as spinach, celery (especially the leaves), tomatoes, pumpkin, green onions, carrots, and chives are good sources of vitamin A, but are not consumed at a level that will increase intakes to the RDA level. Kong xin cai is another food rich in vitamin A that has been recently introduced in this area. Celery leaf is a good source of vitamin A, but most families in Doumen eat only the stalks. They pluck off the leaves to feed to the chickens or pigs. Most people have little basic nutrition knowledge and do not know that the celery leaf is edible. Some years ago the cultivation and consumption of carrots was common in this area. The sandy soil would appear to be ideal for carrot cultivation. However, they seem to have tired of them and have discontinued cultivation. Why Don't They Eat Carrots? Three key-informants gave the same explanation concerning the disappearance of carrots from the region. They said that carrots were very popular from the late 1960s to 1980. Farmers felt that since the growing season was so long, it was, usually not possible to plant another crop after the carrots were harvested. Also, the total production of the carrots was lower than that for other food. The third reason given was that people ate so many carrots during the 1960s and 1970s they just got tired of them. Some important political economic history also contributes to the explanation. The land was owned by landlords before the founding of the People's Republic of China. From 1950 to 1953, the Chinese government began the land reform movement. The lands belonged to the government, and each household was given a piece of land according to the size of the family. Agriculture production was practiced individually. People's working groups and communes were established that were intended to increase their power to fight against natural disasters. Production was greatly increased for a certain period of time. However, due to poor management and policy mistakes, production became monotonous and income did not increase. Therefore, farmers did not work actively and could not implement their own ideas and skills. The second land and agricultural reform was initiated in 1978, and an agriculture input and output responsibility policy was implemented. This policy promoted the initiatives of the farmers, who were allowed to plant whatever they liked according to the market demand. Currently, the people in Doumen village have their own land areas and grow various crops and vegetables. Carrots were introduced in the 1960s by the government, and were intended to be part of a health and nutrition policy. As long as lands were farmed communally, carrot production (and eating) continued. Between 1978 and 1980 the collective farming system changed, and land was distributed to individual households for cultivation. Farmers began to focus on profit and the economic efficiencies of different crops. Both the labor intensity and the long growing season make the carrot a poor capital investment. They are not very popular among the people, and since they are cheap, do not bring in profits compared with spinach, broccoli, cauliflower, and other vegetables. The interviewer asked the question: "Do you eat carrots often?" Mr. Ma replied: "We don't eat carrots too often...we ate them too much previously. The second reason is that the total production is low, and the price is low. Also the growing season is too long (that is why we don't produce and eat carrots here)." Another key-informant commented: "We don't eat carrots very much in our family...If we want to eat them we can buy them in Kai Feng City or occasionally in Wang Fu Zai market." This statement reflects the fact that carrots are not available as a regular vegetable in the local market at Wang Fu Zai, except in the winter. The few carrots sold in the local market during the winter are from Kai Feng City or imported from more distant growers. The people of Doumen usually do most of their food shopping every third day in the market that is only three kilometers away. There are several important animal sources of vitamin A available in the community. These include goats, pigs, cows, chickens, and eggs. However, all animal food is expensive, and meat is not eaten except on holidays or other special occasions. Many respondents reported eating meat only a few times a year. Eggs, however, are eaten regularly if the household flock of chickens is producing. Almost all of the eggs produced locally are consumed in the households, rather than sold in the market. Eggs are said to be particularly good for children, pregnant and lactating women, and sick people. This is the only animal source of vitamin A that is frequently used by the people of Doumen. Milk products are used infrequently, although a few families reported buying small quantities of milk for their children. With the exception of eggs, animal sources of vitamin A are considered unaffordable by the local people. Pig and goat liver, or any animal liver, are extremely good sources of vitamin A. However, most of the respondents think it is too expensive and that families cannot afford to buy it for regular consumption. They may buy pig and goat liver for family consumption only during the Spring Festival, or other special days when they or other neighbors butcher some animals for holidays. The different foods and their price range for 1000 RE is listed in Table 6.3. From the above table, we can see that many vitamin A-rich foods are available in Doumen and -the prices are not very high. If the people could learn the nutritive value, they may gradually change their diet pattern according to nutritional needs.